Can you name this culinary/medicinal herb? Hint: Thanksgiving stuffing, white bean soup, and iced tea. 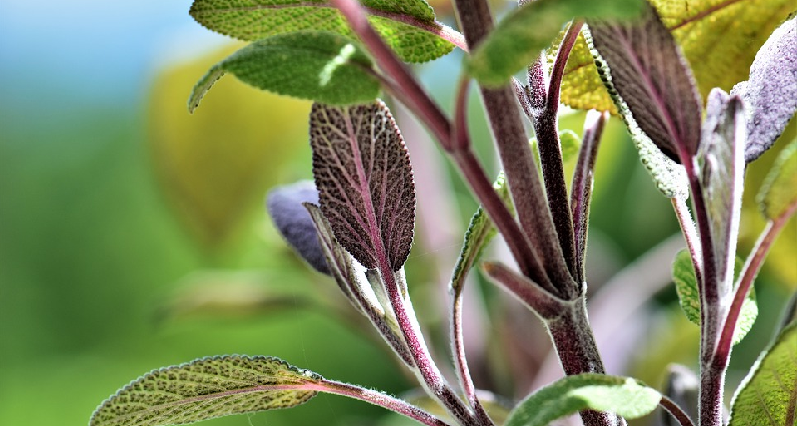 Photo of sage leaves (Salvia officinalis) via Max Pixel and Creative Commons. Sage is not only delicious, but one of our most profoundly powerful antioxidants. So, there’s a chain reaction, sometimes described as a “molecular game of hot potato.” Only this game of “hot potato” leaves destruction in its wake: molecules transformed into free radicals can be damaged or broken, sometimes permanently. Free radicals, then, are a big problem in the body. They’re implicated in everything from heart disease to brain disease, to liver damage, arthritis and cancer. And – here’s the scary part! – wrinkles. So, what to do? Well, we can make fewer free radicals to begin with. We can’t get rid of them entirely since they’re a byproduct of normal cellular metabolism (like exhaust from our cells’ engines). But we can cut back on things that produce them in excess. So avoid sunburns, smoking, fried and BBQed food, overeating in general, toxic chemicals, and radiation. We can also neutralize free radicals once they’re generated. That’s where the antioxidants come in. Antioxidants are compounds which take the free radicals’ instability onto themselves, and then “calm it down,” so it isn’t passed on. This uses up the antioxidant, but it also breaks the chain reaction. So obviously, we want lots and lots of antioxidants, right? For the most part, yes. True, some research has questioned the benefit of daily high-dose antioxidant therapy in the form of isolated vitamins. However, the research on food antioxidants continues to be overwhelmingly positive. And what foods are highest in antioxidants? Well, every other week, it seems, there’s another “new” one marketed at us. (Remember the acai fruit?) The fact is, there is no one “best” antioxidant. The best antioxidant is getting a variety of different antioxidants, from different foods. Here are a few general rules to increase your antioxidant intake from foods. Seek out plant foods with rich, dark colors that can stain your clothing. The more it stains, generally speaking, the better an antioxidant it is. Blueberries, pomegranate, turmeric, saffron, wheatgrass, red wine. Given a choice, choose the dark purple Concord grapes over the pale green Thompson ones; black beans over lima beans; deep green olive oil over see-through Crisco. Pick up a bag of Asiago Foods Frutti di Bosco from our freezer. These are Italian-grown red currants, blackberries, raspberries, and bilberries. Drop a handful in your next protein shake. Bake them into a pie. Or simmer with a little honey, for a berry-licious sauce, for ice cream, pancakes, etc. Eat the colors of the rainbow. Eat variety. Seek out foods that have strong flavors. Very few “mild” foods are antioxidant-rich. Sure, tofu and bean sprouts are fine, but… Add some curry spices, or a handful of chopped lemon thyme, and you’ve doubled or tripled the antioxidant value. Plus, the more flavor you get from herbs and spices, the less sodium you’re going to want. Win/win. Seek out foods that are wild or grown under challenging conditions. Plants don’t make antioxidants to protect us; they make antioxidants to protect themselves. The harsher their environments, the more protective compounds they produce. Seek out foods that were highly valued, historically. All those sailing ships and trade caravans, all those fortunes and lives risked, weren’t just to make food taste better. They were trading for essential preservative and germ-killers in the age before refrigeration. Trading for antioxidants. Those are all general rules. Now let’s look at the numbers. There’s something called the ORAC (Oxygen Radical Absorption Capacity) scale, which measures the antioxidant value of foods. ORAC isn’t perfect, but it’s the standard test. And now the United States Department of Agriculture has a small but growing database of ORAC data on foods and beverages. Here’s what I saw looking through it the other day. Herbs and spices are by far the best antioxidant foods among those tested. The amazing thing is, these numbers are based on incomplete data. Most of the USDA database is compiled by adding up the water-soluble and fat-soluble ORAC scores. But most of these herbs were only tested in a water-soluble system. You could expect the “real” numbers to be a lot higher. Now here are some values for dried herbs. Again, bear in mind blueberries clock in at 5,000-10,000. Of course it’s impossible to say that a certain amount of food “equals” any other food. But based just on the ORAC numbers, an ounce of dried oregano “equals” over a pound of blueberries – the good ones! (So why do dried herbs score higher than fresh? ORAC values are determined relative to weight. When you dry something, you remove the water, which has zero ORAC value). If you don’t have a few containers of thyme and rosemary on your windowsill or your porch, go plant them. Now. Next time you’re making eggs or a grain dish, grab a pair of scissors and snip snip. I’ve always been told to eat the carrot peel, the potato skin, and the grape seeds, because that’s where “all the nutrition” is. Well, what does the database say? So far, there isn’t a whole lot of data. But there is some, at least, on apples. The Red Delicious clocked a 4,275 on the ORAC scale with its skin. But it dropped nearly a third off its total, to 2,936, when the skin was removed. There’s every reason to believe that the “throw-away” portions are equally or even more important with carrots, potatoes, grapes, etc. In fact, there are a number of companies using these discards to develop antioxidant solutions for food preservation and the supplement industry. So now you’re seeing pills of apple skin, pomegranate seeds, and coffee fruit. Basically, we’re throwing away these healthy parts of the food, then buying it back for a premium. Why not just eat it?